This past week, my husband and I stayed with our friends Andy and Bonnie Anderson, who live in a rural part of Oregon. Andy is a well-regarded musician/songwriter who focuses on writing positive, uplifting music. 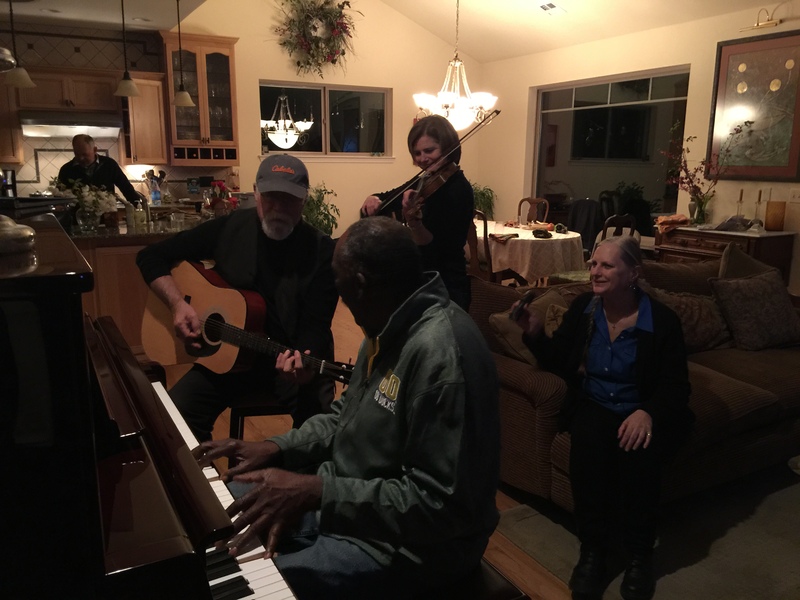 One evening after a lovely dinner with friends, we took out our instruments and jammed together. 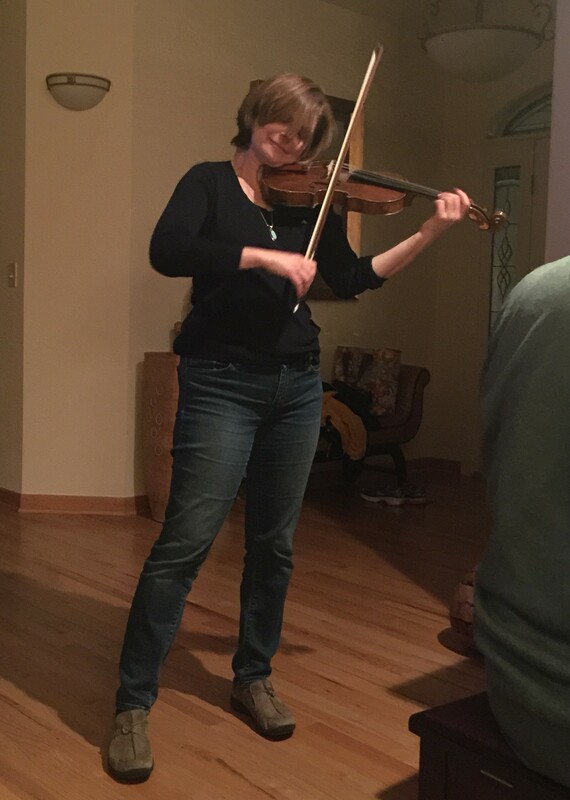 Because I’m a classically trained musician, it was really a stretch for me to play “by ear” and to improvise to a skeleton base line and rhythm. It was quite a stretch for me! Why is it difficult for some of us to improvise and easy for others? Temperament has something to do with it. However, many of us, especially those in the traditional world of business have operated within a set of rules and norms for years. We have been afraid to move out of our comfort zones to experiment, to try something different and risk failure or to embarrass ourselves. When I first joined the executive team at Countrywide Financial in the late 1990’s, I wanted to fit in. However, I led a group that needed to innovate new systems and processes in collaboration with the business division. Our business division’s motto was “Evaluate, Innovate, Celebrate!” We made some bold moves with new technologies, different organization structures and practices, and we had fun too! The author, relaxed and not afraid to make mistakes! My group developed a set of core values from the bottom-up, with 350 employees participating in the process. Our employees refined and validated the core values, then we applied them in all of our processes and activities including hiring, performance evaluations, and recognition celebrations. Core values formed the “skeleton” akin to a musician’s base line and rhythm section. As long as we paid attention to the framework of our core values, we could experiment with novel ideas to provide better systems. Our organization learned together. Sure, we made some mistakes. We promptly acknowledged the mistakes and turned them into learning opportunities. And, I moved out of my comfort zone to risk being labeled “quirky” in order to lead an innovative culture. I’m proud of that label, as well as the many accomplishments of our organization. Many of my former colleagues today still say it was one of the best team environments they’ve every worked in. Do you and your organization have a set of guiding principles or core values that you keep in the forefront of everything you do? Are you allowed to improvise and respond to changing contexts and environments? How easy or hard is it for you personally to risk being considered “different” or “quirky” so that you can truly innovate? You don’t need to stick to the same old tune week after week. Play with a few different variations of the tune, or find a way to harmonize with it in a unique way, while at the same time you can use your core values as a guiding framework for your decisions and actions.